The Savannah has a captivating exotic look. Individuals are sleek and tall with a golden to orange, black-spotted and striped velvety coat. They have a triangular shaped head with large, high set ears. Their weight can vary from approximately 8 to 25 lbs., often depending on the percentage of Serval in the line. Physical attributes can vary among individuals depending on how much Serval was used in the breeding. Savannah owners report their cats have a domestic, dog-like personality. They are apt to follow owners around the house, play fetch and exhibit other intelligent behaviors. They do posses a great ability to jump to very high places and can be extraordinary escape artists. Savannahs are known to have lots of energy and often get along well with other pets such as cats and dogs. They have been known to bond with dogs but tend to assume the alpha status. Savannahs are considered an exotic hybrid cross. While they don’t have many of the legal restrictions of full-blooded Servals, some states do have laws governing ownership of hybrid pets. Some Savannah breeders recommend raw meat diets while others recommend only a premium domestic cat food. Unlike purebred Servals, Savannah cats can be treated by any small animal veterinarian. While there is some evidence that suggests that Savannahs tend to inherit the smaller sized liver of the Serval, this has not been unanimously agreed upon. They may, however, be more sensitive to certain anesthetic drugs. Also, some breeders believe that only killed virus vaccines should be used in Savannahs. The Savannah is the result of crossing African Serval cats with domestic cats. This fanciful cross was first accomplished in the mid-1980’s by an ambitious Bengal cat breeder. Servals were bred with any number of domestic cats including the Egyptian Mau, Ocicat, Oriental Shorthair and Domestic Shorthair to produce Savannahs. 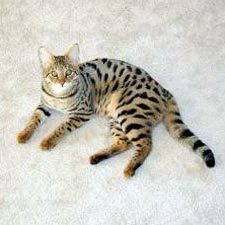 The Savannah breed is currently recognized only by The International Cat Association (TICA).